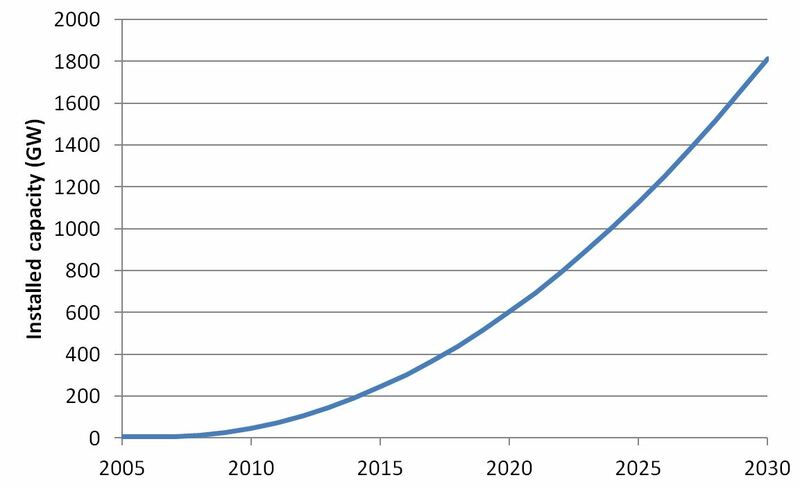 Simple extrapolation of present trends implies around 1800 GW of installed solar PV capacity by 2030, with even faster growth looking possible. Low carbon technologies getting to scale like this, and reducing costs in the process, will help lower the political barriers to increased decarbonisation. Following my last post looking at the large downward trend break implied by the IEA’s solar and wind projections it seems appropriate to look at what a simple extrapolation of trends for solar would imply. The trend towards more rapid deployment of solar globally has been remarkably linear over the last few years, despite large fluctuations in individual jurisdictions. The rate of deployment has been growing at about 6.6 GW p.a. based on historical data (6.9GW p.a. if expected totals for this year and next year are taken into account). Note: Data is from BP Statistical Review of World Energy and Bloomberg. The last two points are short term projections from Bloomberg. Removing these and relying entirely on historic data makes little difference to the results: the gradient falls from 6.9 to 6.6 GW p.a. and the r –squared value falls to 0.97 . The parameters used in the subsequent analysis are taken from the historical data only, and exclude the short term forecasts. 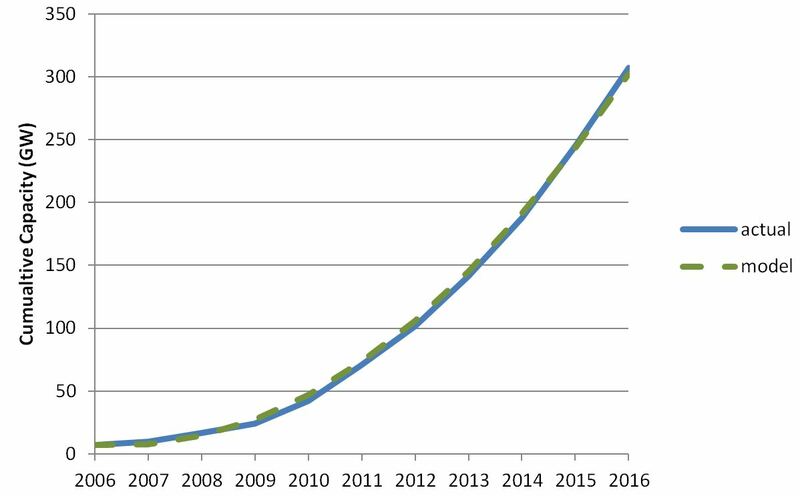 On this trend, cumulative capacity grows with time to the power of two. This model fits extremely closely with actual deployment to date. The lines are effectively on top of each other, and differences are well within the uncertainties in the data and sources of random variation in deployment in any year. Projecting this model out gives total installed capacity of 1814GW by 2030. Solar PV would then account for about 8% of world generation in TWh , with an annual installation rate of around 150GW. Both of these totals remain below saturation levels, so there don’t appear to be any fundamental obstacles to reaching these levels, and indeed continuing to grow. Estimates from this simple model are very close to projections produced by Bloomberg last year, which are based on a more bottom up approach. 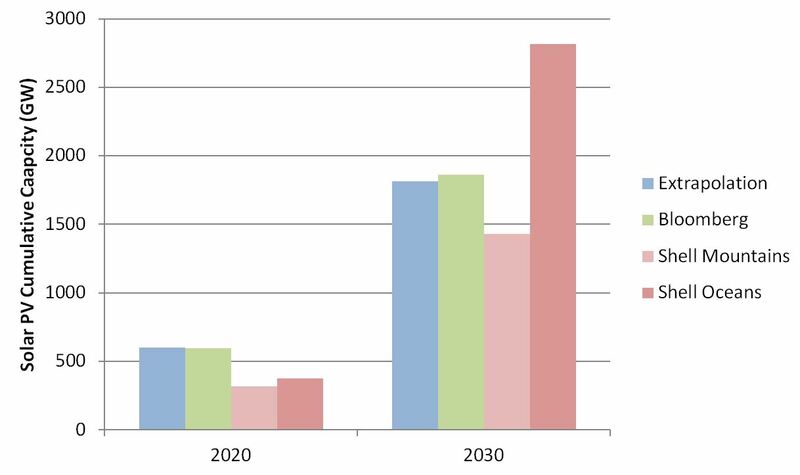 They are between the levels implied by Shell’s Mountains and Oceans scenarios for 2030, though somewhat closer to the lower of these , and above the 2020 totals. There are many reasons why deployment may deviate from this trend. Many of the drivers I referred to in my previous post – falling costs, increased pressure to decarbonise, increasing availability and reducing costs of storage – may lead to faster growth. Conversely if costs do not fall as expected capacity may be below these levels. On balance it seems to me that the odds favour more rapid growth, perhaps closer to the Shell Oceans scenario. Falling costs and increasing deployment of solar coincide with progress on other low carbon technologies, especially those leading to increased energy efficiency. This sort of progress, with new technologies deployed at scale, helps lower the political barriers to policy action. This is likely to lead to more rapid policy development to reduce emissions than has hitherto been evident. 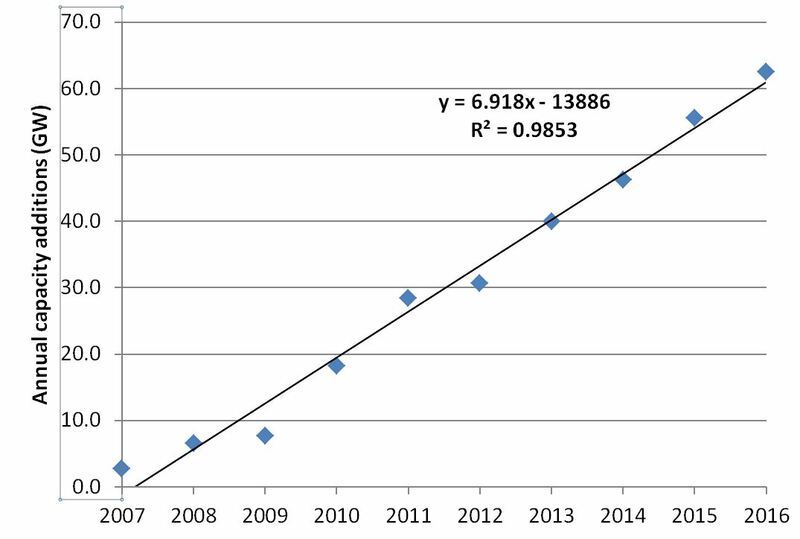 The regressions have not been tested for validity of the OLS regression model (e.g. whether residual are iid), so should be regarded as simply a convenient way of obtaining a gradient. 1814 GW in 2030 is approximately 2540 TWh, or about 8% of global power generation, assuming this is about 10% below the IEA’s central case of 34000TWh. The load factor assumed is fairly conservative at 16%. Higher load factors would clearly increase the proportion of generation accounted for by solar. Shell’s scenarios show energy rather than capacity estimates. I have converted them to capacity assuming a 16% load factor. Their scenarios are for total solar generation, but I have not adjusted these for concentrated solar thermal power generation, which looks likely to be a small proportion of the total. This entry was posted in Climate change policy on 25/03/2015 by adamwhitmore.